Do You Have What You Need to Jumpstart a Car? 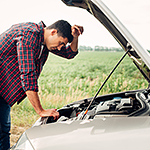 Being able to start a car with a dead battery by using a running vehicle is an important skill to possess, regardless of where or what car you drive. Following a few simple steps can ensure your safety and those of people around you. To transfer charge from the live battery to the dead one, hook the positive cables to the positive terminals of each battery. Do the same with the negative ones. Leave the running car going for a few minutes to let it build up some charge before trying to start the second car. It should start within four tries. Sometimes a battery that has died needs to be replaced. At Spradley Kia, we can test your battery in Pueblo and help you decide if your car requires a new one.